Your kitchen cabinets set the tone for the rest of your kitchen. If you have an open floor plan, they also have a big impact on the overall design of your home. Upgrading your kitchen cabinets can add a major wow factor to the room or even your entire home. You’ll also get a great return on your investment. According to the Cost vs. Value Report for 2015, depending on the scope of your kitchen project, you can expect a 67-80% return on your investment. So take the plunge and turn the most utilized room in your home into your absolute favorite space! Most kitchen cabinets are some variation of a wood stain, or more recently, simply white or black. Consider a more unexpected design choice for your kitchen by choosing a bold color in a smooth finish, like these slick burnt orange cabinets. Keep the rest of your design palette neutral so that your cabinets can make a statement without overwhelming the space. Pair with crisp stainless steel hardware and appliances for a modern look with a ton of personality. If you have high ceilings, or just want to create the illusion of high ceilings, check out bright white tall kitchen cabinets. Depending on the quality of your existing cabinets, this may be a DIY project that you can take on, simply painting and updating hardware to make your kitchen look more upscale. Add crown moulding where the cabinets meet the ceiling to create a seamless look. If you like the clean look of glass cabinet doors, but are afraid you don’t keep a tidy enough kitchen to have the contents of your cabinets on constant display, there is a compromise. Replace a few cabinet doors with glass inserts to make your kitchen look more open and to showcase items that you love, like vintage tea cups, fine china, or your favorite teal plates that add a great pop of color to your kitchen. Add simple lighting in cabinets to highlight your special items, while making your kitchen feel brighter, larger, and more welcoming. Most wood grain cabinets can make a house look very dated. But there's no need to abandon them all. You can still enjoy the durability and warmth of wood cabinets and keep the space looking contemporary just by choosing a more modern finish. These wooden cabinets conjure the soft rustic feel of reclaimed wood. Their multidimensional color gives a weathered look from afar, while the smooth finish, glass shelves, and bright white countertops help the space look light and modern. If you have a passion for cooking and entertaining, it probably shows in your kitchenware. Don’t hide beautiful serving dishes or your fancy new kitchen gadgets behind dark, heavy cabinet doors. Convert all of your cabinet doors to glass to create an open space that showcases all things culinary. 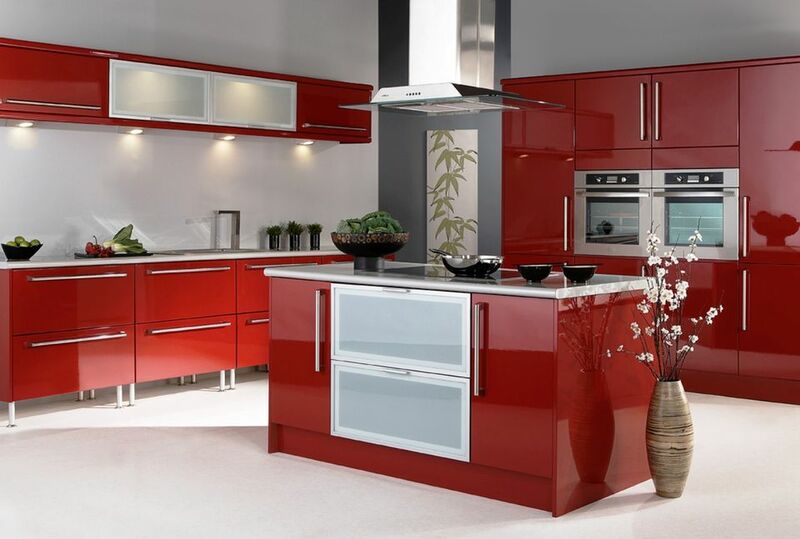 Glass cabinets turn your kitchenware into artwork, so the colors and patterns of your dishes become just as important design choices as your wall color or backsplash. Glass cabinets force you to stay organized – at least when company is coming over – or risk having to witness the disarray every time you enter the kitchen. They also make it much easier for guests to navigate your kitchen.